What Day Of The Week Was August 19, 1991? 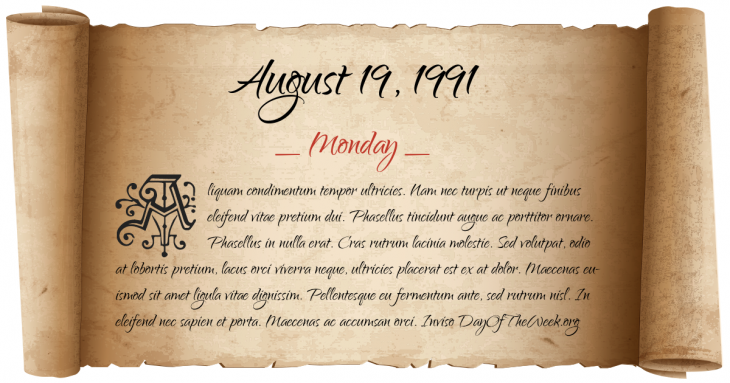 August 19, 1991 was the 231st day of the year 1991 in the Gregorian calendar. There were 134 days remaining until the end of the year. The day of the week was Monday. A person born on this day will be 27 years old today. If that same person saved a Penny every day starting at age 7, then by now that person has accumulated $75.53 today. Crown Heights Riot: Black groups target Hasidic Jews on the streets of Crown Heights during 3 days, after 2 black kids were struck by a car driven by a Hasidic man. dissolution of the Soviet Union, August Coup: Soviet President Mikhail Gorbachev is placed under house arrest while on holiday in the town of Foros, Crimea.